Nothing lasts forever and good things sometimes end very quickly. The Dallas Cowboys earned respectability back thanks to an excellent season which included making the playoffs for the first time in five years. But sustaining that success is important, which means keeping this roster together, a complicated feat, especially when it includes having to re-sign both Dez Bryant and DeMarco Murray. Bryant is one of the best receivers in the NFL if not the best of them, finishing the season with over 1200 yards and 12 touchdown receptions for a third straight time. Murray played the entire 16-game schedule for the first time in his career and led the NFL in rushing, going for 1845 yards and scoring 13 touchdowns. They are both 26, and will be looking to sign a very big contract, which they deserve. But can it be with the Cowboys? 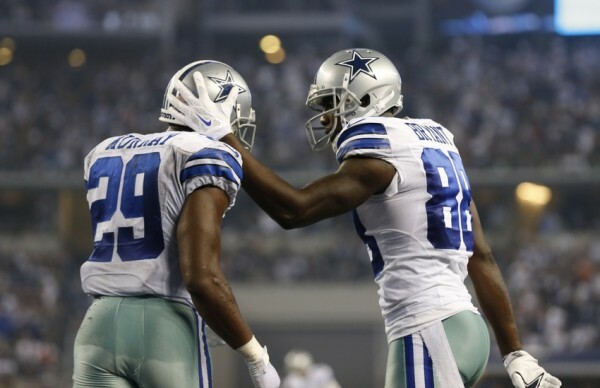 According to Jerry Jones, it’s financially possible to re-sign them both. But does it make sense? Not that much. The Cowboys are finally in a position where the cap space isn’t suffocating them and don’t have to start re-structuring a handful of contracts in order to simply go under it. Giving both Murray and Bryant what they want would put them back in the same situation, and the Cowboys want the ability to be competitive in free agency. Right now, it looks like Bryant is the more important player to re-sign for the team, and the one more likely to be franchise tagged if the negotiations don’t work out. A franchise tag for a wide receiver is worth $12.5 million a season, but the Cowboys will be hoping they can make a deal with Bryant worth around $10 million a season and ensuring it doesn’t kill their cap flexibility with other contracts needing re-signings. As good as Murray was this season, he carried the ball 392 times. He didn’t get injured in a way that kept him out of games, but running backs that had that kind of work load rarely go on to have the same kind of season ever again. Murray is the ninth player in NFL history to carry the ball at least 392 times in one season. No one has done it twice, and everyone on this list saw huge drop offs in their production in a season or two following their peak “workhorse” years. That logic suggests Murray is the expendable one. That’s the logic in the NFL in general for quite some time. Murray is very good, but his success is mostly attributed to the ability of the offensive line to run block for him, not to mention playing to a very efficient passing game. One feeds off the other, but running backs just aren’t perceived as franchise cornerstones anymore, and very replaceable, especially after a season in which they’ve been used so much. Dallas have a very good thing going for them after frustrating 8-8 seasons. The offensive line was built very well through the draft, they have a good quarterback situation for at least one or two more seasons and their defense will probably get better. Having playmakers is important, but it shouldn’t cripple a team. Unless some deals (like Brandon Carr making $13 million next season) aren’t restructured (which means taking a paycut), it’s hard to believe both Bryant and Murray are staying on for next season.